Best containers for freezing tomatoes? What are the best containers for freezing tomatoes? The best containers for freezing tomatoes hold liquid well. When prepared for the freezer, chopped tomatoes act as a liquid because they contain so much juice. Look for containers that have a strong seal to prevent freezer burn. Easily stackable containers allow you to use freezer space well. Make sure to label filled containers with contents and date. Permanent marker is ideal for labeling plastic bags. Freezer containers are re-usable, so adhesive labels are a better choice for them. Made from rigid plastic, these containers for freeing tomatoes are most often cube-shaped and stack well in the freezer. Their stiff forms make them ideal for freezing chopped tomatoes and tomato juice. Plastic freezer containers are dishwasher-safe and can be used for many years. Look for containers that are labeled “freezer quality.” They’re available in a variety of shapes and sizes, including pint and quart. Make sure lids seal tightly. Reliability and re-usability make plastic freezer containers a good choice for freezing tomatoes. Availability. Most discount department stores carry freezer containers during the growing season. (Availability varies during the winter.) Plastic freezer containers are available year-round online. Initial cost. Although not expensive, freezer containers initially cost more than freezer bags, but don’t need to be replaced every year or two. Space. Containers must be stored after use until next season. Freezer bags are widely available at grocery stores and discount department stores under several brand names including Ziploc®, Glad®, and Hefty®. They are stronger than standard plastic storage bags, which prevents freezer burn. Most are constructed with a plastic zippered closure. 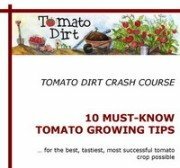 Tomatoes can be poured into freezer bags, excess air removed, and zipped shut. Then, by laying the freezer bags on their sides, the packet can freeze flat, saving space. They’re available in pint, quart, and gallon sizes. More expensive freezer bags are generally worth the extra cost because they last longer and don’t tear as easily as cheaper ones. Because of cost and versatility, freezer bags are an acceptable choice as containers for freezing tomatoes. Cost. Freezer bags are inexpensive. Accessibility. Freezer bags are available year-round in any grocery store and online. Versatility. Freezer bags can be thrown away after use or washed and re-used if you choose. Short life. Even with careful washing and use, freezer bags can last only a season or two. Storage. Bags take on the shape of their contents, which can mean awkward stacking in the freezer – unless you pack tomatoes carefully and freeze the bags flat. A vacuum sealer is a small apparatus that removes air from a plastic bag (which has been filled with tomatoes) and creates an air-tight seal with a heat strip. Tomatoes preserved this way can last up to 2-3 years in the freezer. Vacuum sealers are used with sealing bags, which come in rolls. Vacuum-sealing sets are available online and are sold under brand names including FoodSaver®. Expense and effort make vacuum-sealed bags a less-favorable choice as containers for freezing tomatoes. Seal. Excess air is removed from bag, which keeps tomatoes fresh longer. Cost. Vacuum-seal apparatus and special bags must be purchased. Bags cannot be re-used. Time and effort. Chopped tomatoes must be frozen before placed in vacuum-sealed bags or they will seep through the bag’s edges during the vacuum and sealing processes. Freezing chopped tomatoes flat before placing them in vacuum-sealed bags adds an extra step. For most home gardeners, this makes vacuum-sealing impractical. 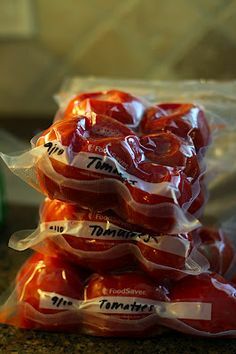 Freezing whole tomatoes in vacuum-sealed bags is a bit easier, though tomatoes are juicy and you’ll need to be careful during the packing process. Storage. Bags take on shape of contents when sealed, which may mean vacuum-sealed whole tomatoes are stacked and stored awkwardly in the freezer. Also, vacuum-sealing apparatus must be stored when not in use.